After completing her form 5 studies in 1997, Thabo Rankoa struggled to find formal employment. It was at that juncture she decided to follow her passion of becoming a hairdresser. 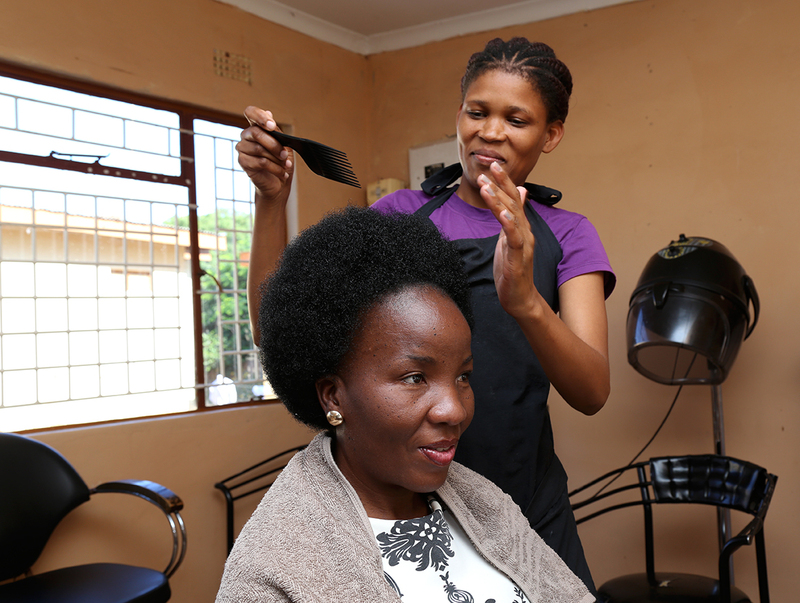 Finding it difficult to open up her own salon, she started working for an upmarket salon in Gaborone in 1998. 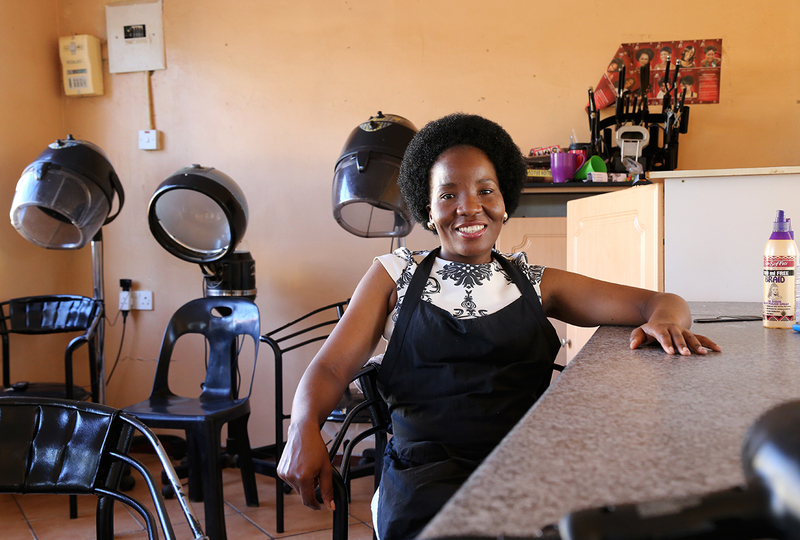 After being employed as a hairdresser for five years and learning the tricks of the trade, she decided to open up her own hair salon in Mochudi in 2003. Since primary school I always had the desire to become a hairdresser and braided a lot of my family members and friends hair from home. 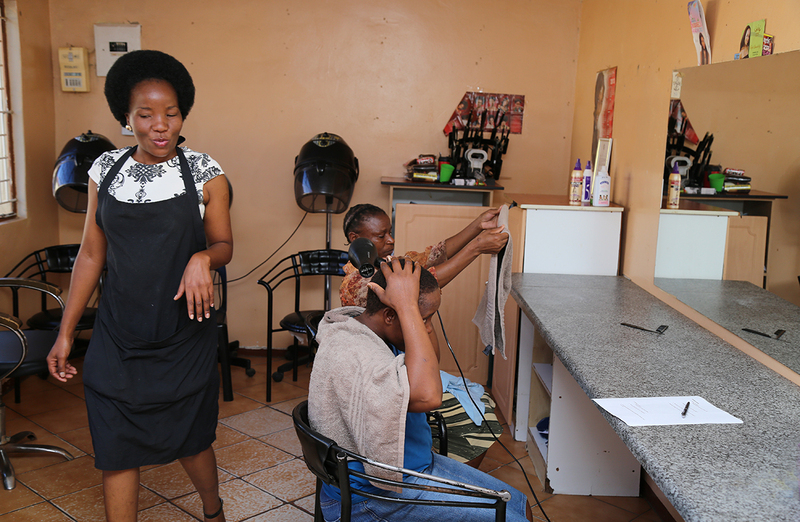 I charged a nominal fee but later realised that there was potential in opening up a small salon that could generate income. 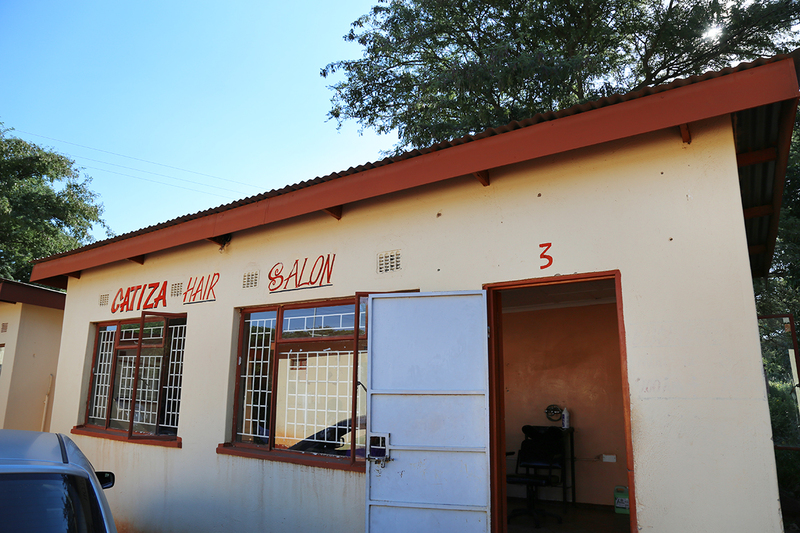 In 2003 I found a small location in Mochudi and set up my business called Gatiza Hair Salon. 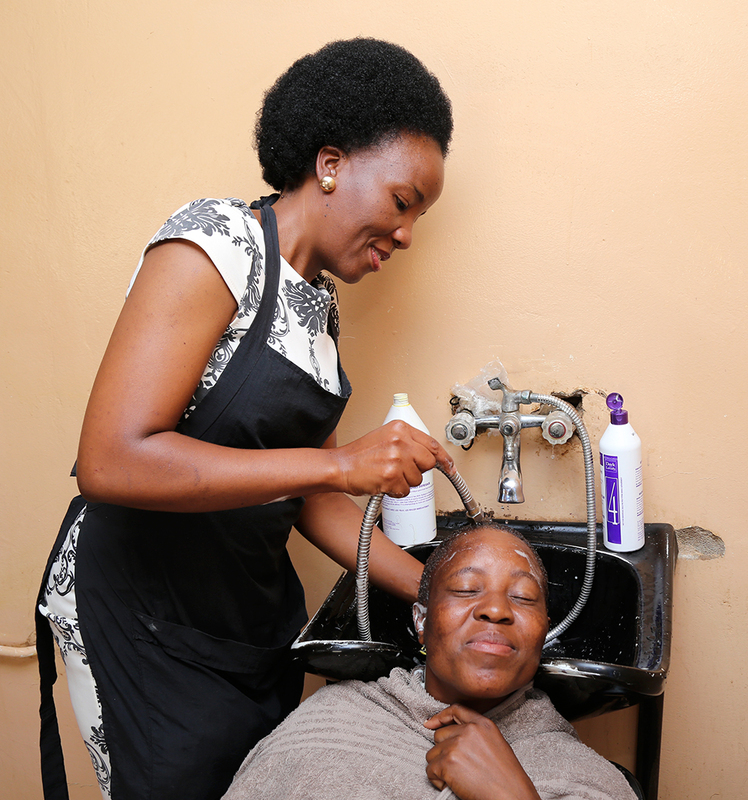 With my experience from the upmarket salon, I started inviting people to do their hair at my salon. As the years progressed I developed a good clientele as people really trusted me with their hair. I have always been passionate about hair, particularly since I was good at it and more importantly people really trusted me with the quality of my work. This motivated and prompted me to look into setting up my salon and becoming my own boss. I had very little money but found an affordable location with very little equipment to start with. This however did not deter me to continue as I saw an opportunity for growth. The more business I got the more I saw it fit to really invest in myself. Every bit of money I made I invested back into the business. What made you approach CEDA to expand your business? I had been telling my family and friends for a long time that I had wanted to expand my business but was limited by financial resources and continuously asked myself where I would get financing. Many friends told me to approach CEDA and present my business case. I was very hesitant because I would be taking a risk by taking a loan and not being sure if the business would be successful enough to repay the loan. I had always thought that CEDA was targeted to people with larger and more successful businesses and really doubted that I would qualify. My friend then told me to look into Mabogo-Dinku as it was a new product targeted at micro-entrepreneurs such as myself. How was the application process and tell us what difficulties you encountered with Mabogo-Dinku? The first step of my application was when a friend and I went to enquire on how Mabogo-Dinku worked and what the requirements were. We were fortunate enough to meet a Micro-Finance Officer that really broke down the requirements of how it worked. 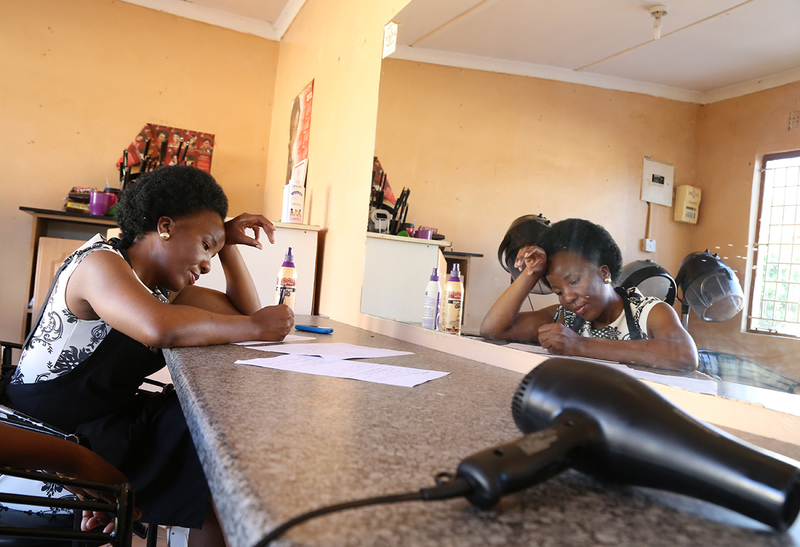 They explained that in order to qualify for the loan we had to come as a group of 5 or more people and we could get loans of P500 to P150 000 each. Within this group however there should be different businesses. They explained in detail how the product worked and showed us how to fill out the forms. The documentation was rather daunting in the beginning as it was all written in English but the Officers explained each step. They later brought documents translated into Setswana which made it a lot easier for us. At each stage the Officers were polite and more importantly courteous and patient. They helped us fill out each section whilst also explaining the different stages. One of the biggest challenges however was the long wait we encountered. Due to the product being new and the influx of other people also requesting funding through Mabogo-Dinku we knew we had to wait. What I appreciated though was the fact that they kept us informed at every stage of the process and how far our application was going. Out of our group of seven, 3 of us were financed through Mabogo-Dinku. How has your relationship with CEDA been thus far, has the Agency offered you mentoring and training and any other information? The Micro-Finance Officers responsible for my business have really been good to me. Prior to receiving the funding, we were trained as a group on Mabogo-Dinku requirements and how to ensure our businesses survived. They conduct regular on-site visits to our projects to ensure we are keeping our end of the loan agreement. In light of the recent water and electricity crisis we used to face a lot water and electricity problems. Electricity and water are key things in our business and we need them to blow dry, cut, iron and wash our clients’ hair. There have been times we lost business because Electricity and water were not available the whole day meaning a whole day of income was lost. I firmly believe I am a market leader in my location. I get a lot of business as compared to my counterparts in the same complex I work from. This is largely due to me marketing my salon wherever I go. I always ask my customers to refer their family and friends to my salon and through word of mouth I build my client base. There is always competition in the salons but it is important to not let that phase you and deter you from your end goal of ensuring your customers are happy. I am also fortunate that with the experience I have gained over the years I am able to come up with various hairstyles which keep my customers happy. With this business, people are attracted to your salon simply by seeing what you have done for other customers. It is important to provide good customer service every single day as that will keep your customers coming back for more which is the lifeline of my business. In time I want to open up other salons in the Kgatleng District primarily. This can only happen by building my business through a strong client base that can refer more people to my salon. When I initially started I had four employees, at present I employ two. In the salon industry it is hard to keep employees because they are often poached by the bigger salons in whatever location you are in. Some have chosen to be loyal because I treat them well and train them. At the moment I am happy with the staff I have. How do you maintain relationships with your clientele? Over the years I have built strong relationships with my customers and they have also proven to be loyal as they keep coming back for more. I keep a record of their contact details and keep in touch with them. My number is always available and they call me for appointments whenever they need my assistance. I also give discounts to my regular customers, this encourages them to keep coming back. Lastly I am also competitive with price and constantly keep up with the market and introduce different and unique hairstyles. What are your other passions beside the salon? I have a plot in the Kgatleng District that I would like to develop and turn into an entertainment venue where I can host weddings and private parties. I really think it is in a prime location and this would be a good way to make additional income. What advice would you give aspiring entrepreneurs that want to start your line of business? I believe that everybody has the equal opportunity to start a business. The key elements of starting a group for Mabogo-Dinku are to know who you are dealing with and going into the agreement with. For business in general, entrepreneurs have to be realistic and get into a business they have researched and are happy to put their every effort in. Business is hard as it is and requires resilience, patience and a positive attitude to people I believe if you love what you do you will never a work a day in your life.